This article provides a practical explanation of the Capability Maturity Model. After reading, you’ll understand the basics of this powerful implementation and development tool. The Capability Maturity Model is a method used for developing and refining software development programmes. The model simulates the evolutionary path of software development in mature processes in five steps. Maturity refers to the level of formality and optimisation of processes, from ad-hoc activities to formally defined steps and the monitoring of result statistics to the active optimisation of the processes in development. The maturity model can be seen as a series of structured levels that describe how behaviour, the practices and the processes of an organisation can produce the desired results in a reliable and sustainable way. The maturity model can also be used as a benchmark tool for the comparison of results and as an aid to identify a comparison basis between different organisations. The Capability Maturity Model was developed and released by the Software Engineering Institute (SEI), a research and development centre sponsored by the U.S. Department of Defense. Although this model was developed for software development, the CMM is also used to develop and optimise business processes in general. World-wide the model is used in government offices, trade and industry. There is a lot of uncertainty in the initial phase of process development in an organisation. It is unknown how processes work and how they need to be improved. Success is determined by individual input and results due to a lack of procedures or other formal process descriptions and goals. These structures can’t be repeated because there simply is no documentation on how they were reached. The uncertainty on this level is often the cause of chaotic situations, budgets to be exceeded and deadlines to be missed. Goal. What is the use of the process? Is this process a crucial part of the business strategy and is this process sufficiently customer oriented? Input. 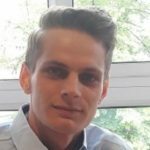 Which tools need to be accessible to execute this process. What does it cost? Output. Which tools are produced by this process? What does it yield? Role distribution. Who does which activities? Who has the best competences for that? Entry criteria. When exactly and under which circumstances can these processes be enacted? End criteria. When exactly and under which circumstances can this process be ended? Procedures. How is the process documented so it can be repeated later? Evaluation. How is the implementation of the process monitored? How can evaluation help to optimise? Tools. Which tools are needed to implement the process even more efficiently? On this level, several of the criteria above are evaluated and recorded. The information or knowledge that is recorded comes from experiences. On this second level, the process is already clearly in development and under normal circumstances this process is predictable in terms of money and time. Because of the predictability and accuracy, the process can be repeated. The business process is repeatable from here, but when entering new methods, procedures or technologies, the development falls back to the first level. Setbacks and inconsistencies may also be detrimental for the development of the process. The process in development is completely defined and under control on this level. The procedures are accurate enough, so inconsistencies occur less often. The different (additional) processes are also well-integrated in the entire organisation so a well-oiled machine is created. Setbacks and inconsistencies are anticipated so the process can always remain operational. Despite the smooth progression, we still speak of development; the process is not yet mature. However, this is more aimed at optimisation than shaping. Most organisations stop development of the process here because the next steps require additional investment. And the process is already effective enough. On this level the process is completely controlled. The quality of the process is systematically assessed to determine deviations and improve if necessary. The process can be assessed by implementing quantitative analyses. The data produced by this is used in the optimisation of the process. An example of a model that can be used for this purpose is the SERVQUAL model. On this level, the systematic improvement of the processes has been added to the operational management. By receiving qualitative feedback, the processes are proactively amended. Even when new technologies need to be implemented, this can also be controlled without the process losing effectiveness. This also includes preventive research into possible defects or inconsistencies that may occur. The Capability Maturity Model ensures that the organisation has more control over the predictability and consistency of procedures and other processes. By focussing on the customer, it is possible to make better predictions and prognoses about the need for a product or service, for example. In the competitive market, both within the information technology and outside it, development and innovation is of great importance. The use of CMM facilitates faster response to new customer needs, for example, to stay ahead of the competition. By using Capability Maturity model, mistakes in the existing and new procedures are noticed, after which measures can be taken if necessary. The more quickly mistakes are resolved, the less costs accompany them. Moreover, analysis of the process may uncover unnecessary steps or actions and thus allow people to work more efficiently. This may increase the productivity. 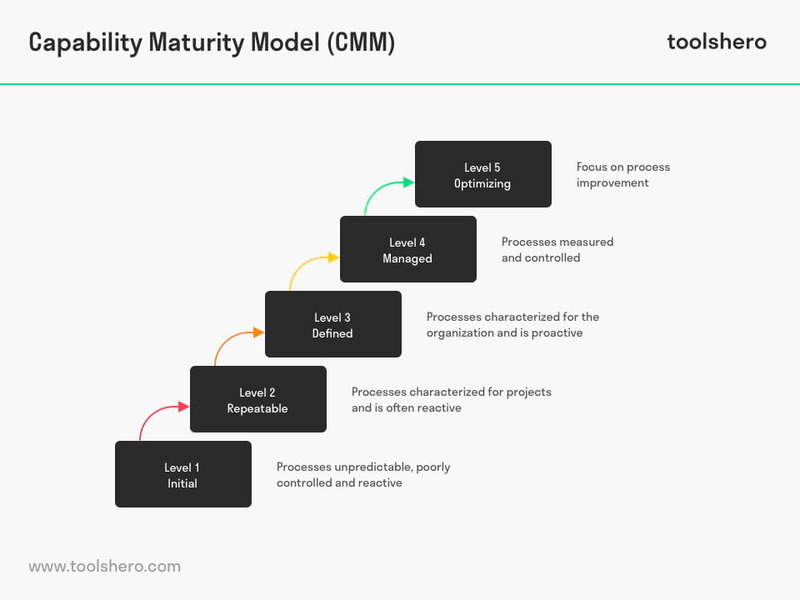 The Capability Maturity model describes different phases in the development of a process. The speed at which development takes place depends on the capacities of the organisation to develop. By continuously developing processes, an organisation can stay ahead of the competition. However, the financial tools do need to be available for this. What do you think? Do you recognise the explanation of the Capability Maturity model? Do you think you can also optimise certain processes in your business or environment? What do you think are the aspects that contribute to the effective development of business processes? Paulk, M. C., Curtis, B., Chrissis, M. B., & Weber, C. V. (1993). Capability maturity model, version 1.1. IEEE software, 10(4), 18-27. Paulk, M. C., Weber, C. V., Garcia, S. M., Chrissis, M. B. C., & Bush, M. (1993). Key practices of the capability maturity model version 1.1. Herbsleb, J., Zubrow, D., Goldenson, D., Hayes, W., & Paulk, M. (1997). Software quality and the capability maturity model. Communications of the ACM, 40(6), 30-40.